Corruption is a complex adaptive system – it does not stay still while being attacked, but rather evolves to survive in the face of new constraints and barriers. Many anti-corruption campaigns aim to target corruption directly and publicly. They are clear in their mission and have project titles that include the words “anti-corruption.” This directness is important in many respects, but being so visible makes it easy for people in power to applaud these initiatives in public – and to avoid them, or even undermine them, in private. By the time the project reports are written, the systems that facilitate corruption will have shifted, adapted, and survived. So there is an argument to be made for combatting corruption quietly – through projects that no one would recognize as being anti-corruption. These projects serve as Trojan horses to help anti-corruption measures slip past gatekeepers and power brokers, and perhaps stand a greater chance of surviving and planting the seeds of change. In late 2016, Louino ‘Robi’ Robillard was not expecting to embark on an anti-corruption campaign. Robi is a community organizer from Cite Soleil, which is Haiti’s largest ghetto. Because of decades of gang activity in the area, Cite Soleil has been marginalized economically and socially by the rest of Haitian society, resulting in widespread poverty and stigma. An informal ceasefire that began in 2016 provided a window for civil society in Cite Soleil to take on initiatives that would be more challenging in times of active conflict. A youth club in Cite Soleil called FACHaiti decided they wanted to build a library to provide a much-needed community space for young people to read. They approached Robi for help with fundraising, but Robi pushed them to first pitch their idea to residents of Cite Soleil – the vast majority of whom lived on less than 2 US dollars a day – and see what they would contribute. 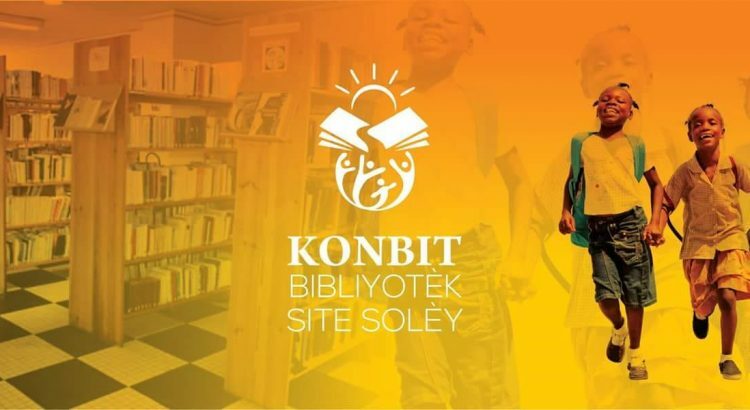 They called the initiative Konbit Bibliyotèk Site Solèy. In Cite Soleil, development projects have long been used as a vehicle for corruption and money-laundering. Projects are often routed through politicians, fixers (called abolochos), and gangsters, each of whom takes a cut from projects to fund illicit activities. This is common knowledge in Cite Soleil, making residents skeptical of most projects. In order to help Cite Soleil’s residents overcome their distrust of development projects – even local ones – Robi proposed a campaign of total transparency. 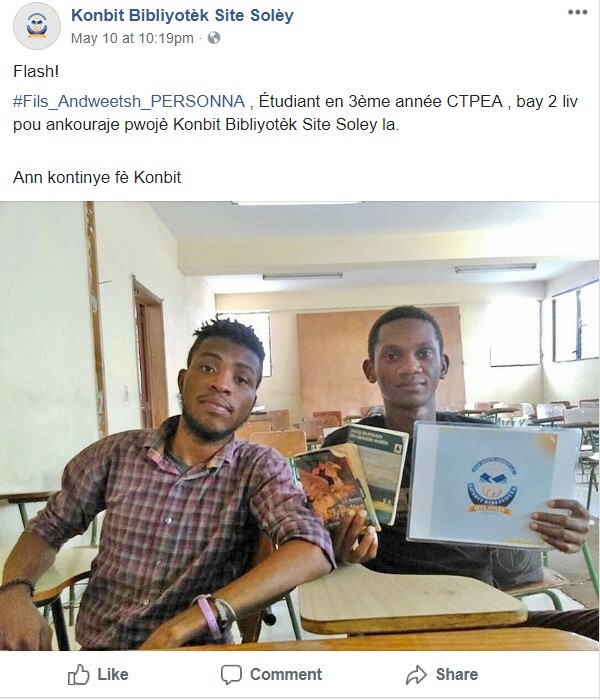 Each donation – no matter how large or small – would be photographed and posted on the Konbit Bibliyotèk Site Solèy Facebook page. Then, every Sunday, the money and books would be counted in public at the community radio station and posted on Facebook. Anyone was welcome to supervise the weekly count and compare it with the photographs posted of donations. The campaign became wildly popular, and within the first six weeks, over a thousand people in Cite Soleil had contributed. 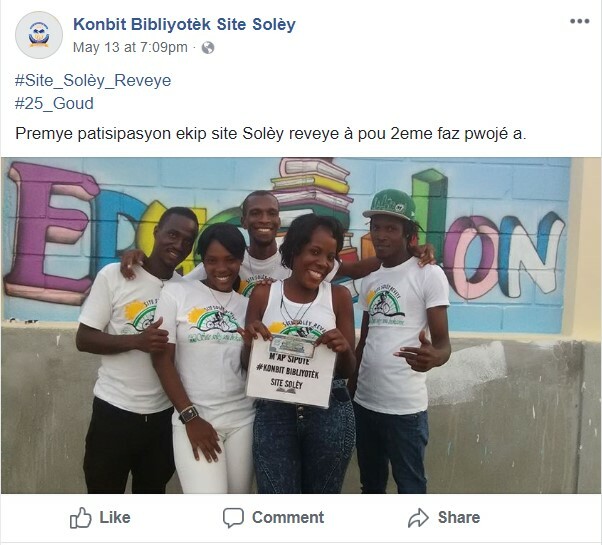 It became clear very soon that this approach was having a greater effect than just building trust in a library campaign: it was changing people’s expectations about transparency in Cite Soleil. Robi’s first hint that this simple project could have an effect on endemic local corruption was when he began getting phone calls from powerful people, saying they would contribute to the campaign if only Konbit Bibliyotèk would stop that pesky habit of making donations public. Several politicians were even more clear, complaining that their constituents had begun to ask them why they weren’t being as transparent with their funds as the library project was being. But the volunteers stayed firm in their principles – refusing anonymous donations and continuing to publish weekly reports. The project – and by extension, the volunteers – was protected by its innocuousness. If this had been an overt anti-corruption initiative, politicians and gang leaders would have felt threatened, which would be justification enough for them to shut down the project. A ceasefire doesn’t apply to hitmen, any of whom could have been paid $50 to kill an anti-corruption campaigner and make it look like a robbery. But this wasn’t an anti-corruption campaign. This was “just” an innocent project to build a community library. The social media postings were “just” a way to better advertise the generous contribution they were making. Those in power were not the target of the initiative, they were “just” one of thousands of donors. The project may have annoyed or even frustrated people in power, but it was never seen as threatening. It was too subtle, too quiet. 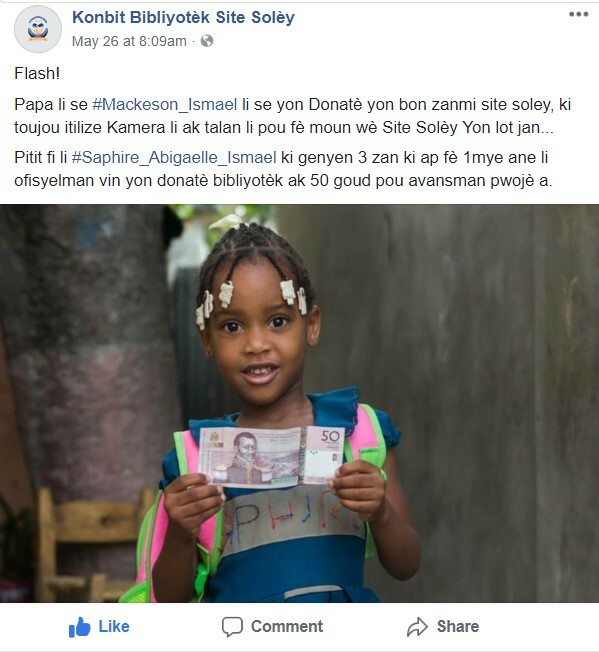 The power of the project also lay in its popularity: with thousands of residents of Cite Soleil having already made donations, there was a sense of widespread ownership that was not to be taken lightly, even by those in power. No one wanted to be seen standing in the way of the library. So eventually, one by one, Cite Soleil’s power brokers fell in line. Politicians, businessmen, abolochos, and eventually even gang leaders agreed to take pictures with their donations and have them posted. This may seem insignificant to the outside observer. Just because powerful people were posting photos of their donations to a community cause, that did not mean they weren’t still pocketing funds from any number of other projects. But ending corruption requires more than a changing of laws and protocols – it requires changing social norms. And in Cite Soleil, people were getting a taste of transparency, and they were beginning to feel like they deserved it. The project continues to this day. Over sixteen months since the project began, more than 4,000 individual donors have contributed to the project. Construction of the library is beginning, and the same principles of transparency are being exercised with expenditures as they were with donations. 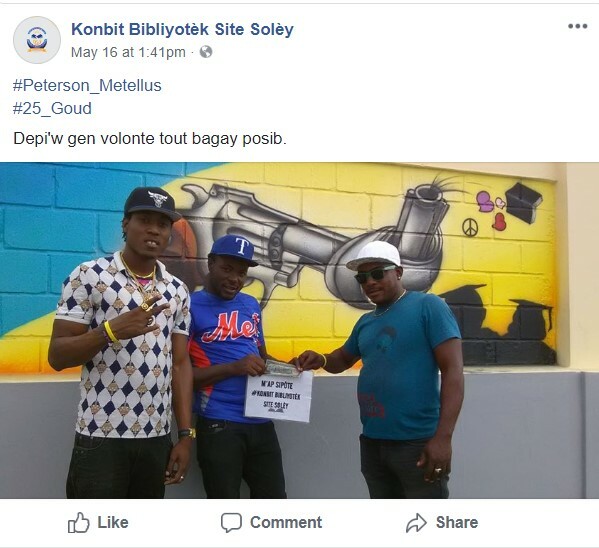 Receipts are collected and posted onto a website once a month for everyone to see; to provide access to Cite Soleil’s large illiterate population, a monthly video called a “visual expense report” is published to Facebook. Changing the social norms around corruption and transparency takes time. And the social experiment of Konbit Bibliyotèk has been able to continue for this long because its leaders managed to avoid making enemies in a place where death is cheap. They are making change quietly and slowly, not calling attention to the project’s potential to fight corruption. They, and the initiative, may survive long enough to move the needle on social norms around transparency and accountability in public projects in Cite Soleil.